Many first responder medical personnel often comment on the challenges they continually encounter to hone or upgrade their skill sets through professional casualty simulation instruction, application, and performance. This is largely due to funding deficits and/or lack of access to higher value educational resources and qualified schooling. As such, their field training exercises often fall short of providing measurable results that can enhance their speed and techniques in injury recognition and triage time. One of the major obstacles that both civilian and military EMS responders face is to successfully educate their executive or financial decision makers in the significance and positive direct impact professional moulage education has on field training applications. They are crippled by a common view that casualty simulation is more of a tolerated nuisance exercise than a significant investment in enhanced education which provides realistic training environments and sharper measure outcomes. As a result, funding for professional training in casualty simulation moulage is virtually non-existent. This adverse mind set fosters a “lack of access” continuum that is driven by these faulty perceptions. They fail to comprehend that providing their personnel funding and access to (casualty simulation moulage) training experts and high fidelity materials resources can positively affect the creation of optimal and accurate clinical and battlefield scenarios for successful learning results that measure quality and quantitative improvement. 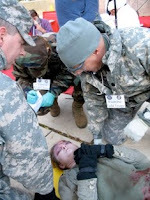 Studies on the benefits of casualty simulation training by respected academic institutions, such as the Uniformed University of Health Sciences, concluded that moulage had a direct contribution to reduce combat medic “freeze” in theatre, thus more lives can be potentially saved on the battlfield. Inferior casualty simulation protocols tend to be far less effective and don’t foster cumulative knowledge in application or performance. They don’t result in a collective pool of increased information, shared experiences, and sustained educational resources. Rather, they ebb and flow or just fade away as lead educators and/or their staff rotate in and out of training positions. Thus, the majority of these departments fail to establish a quality casualty simulation training standard of value to hand off, nor have they acquired any significant moulage asset s. Ultimately there is no real provision for training sustainment or updated moulage application procedures for their incoming counterparts. To be fair in this observation, a few civilian companies and government installations do make some effort to find and resource their first responder personnel with professional moulage training. But invariably it goes back again to the same problem in building up and sustaining the quality of knowledge and experience momentum gained as those moulage trained personnel come and go. Thus, an optimal casualty simulation training platform never becomes a fully established program with continuity to hand off, or one that can accommodate any kind of positive sustained training for routine staff changes. Therefore, the lack of importance, priority, or failing to identify and maintain the need for high fidelity casualty simulation programs with high standards of execution directly contributes to a deficit in factually accurate measure of expected outcomes or identifying negative training implications. Without a benchmark to hold forward to, inferior training exercises invariably end up wasting people’s time and resources, and with failed objectives. Emergency medical response in a post-9/11 world demands as much realistic hands-on casualty simulation training whenever and wherever possible. It will always be paramount to successful combat readiness, and a critical gauge for proper response and reaction time. What is realistically experienced and learned is ultimately better retained, and results in enhanced skills in performance. Therefore high fidelity replication of military battlefield or civilian disaster injury case scenarios must be a part of successful field training exercises that engage real to the eye injury reproductions. Trainees must train and interact with the very best agents of expertise available in casualty simulation and high fidelity moulage. Military Moulage Combat Injury Simulation exists solely to serve the professional casualty simulation training needs of those working in the field of pre-hospital care in all theatres of operation. We are the experts that stand with these medical providers in their focus to keep current in rapid injury recognition in their triage training in order to perform the highest level of care under fire. We understand that all pre hospital health care providers need to be challenged and engaged in the highest quality casualty simulation training that must include the most realistic to the eye injury scenarios. Our company provides a complete state of the art casualty simulation moulage program that uses only high fidelity training materials and methods. We have a team of the very b est professional military combat medics who co-instruct these workshops so that our students learn to perform moulage at the ultimate level of realism, and with the most innovative techniques and provisions available. We created the distinctive Identical Depiction Reality™ method for ultra realistic casualty simulation performance techniques. This is a “turn-key” style of instruction and execution that results in an auto-sustainable casualty simulation moulage resource for any organization or installation. With little effort our program can be easily transferred along staff lines yet retain a high degree of accuracy. Our training protocols are unmatched by any other moulage program, and the “train like you fight” approach gives medics the leading edge they need to be successful in any theatre of operation. For more information please contact us and ask for our training brochure. Our current workshops are posted on our training page.